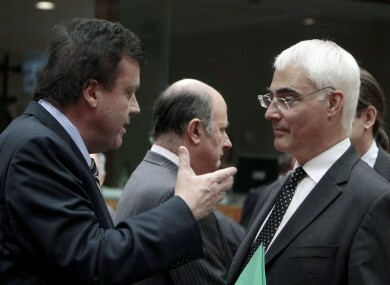 Alistair Darling has given his own insight into the decisions taken by Brian Lenihan at the time of the bank guarantee. THE GOVERNMENT’S GUARANTEE of the banks in September 2008 smacked “of panic rather than a plan” according to the UK Chancellor at the time. Alistair Darling has revealed that the first he heard of the decision by then finance minister Brian Lenihan to guarantee the banks was on the BBC News at 6am on Tuesday, 30 September. In his new book, Back from the Brink: 1000 Days at Number 11, Darling gives an insight into discussions he had with Lenihan at the time, revealing that the first word he got of the guarantee was when he turned on the Today programme at 6am and heard the news. He writes that the “unilateral declaration” had gone contrary to what finance ministers across Europe had agreed – to keep everyone informed of what was going on. He writes that he was told by Lenihan later that morning that the decision was taken very late at night and there had been no opportunity to tell him or anyone else. Darling, who served under Gordon Brown as Chancellor until Labour lost power in 2010, reveals that he later found out that the decision was taken at around 2am. He describes this as something that “smacks of panic rather than a plan”. Email “Bank guarantee was ‘panic rather than a plan’, says former UK chancellor”. Feedback on “Bank guarantee was ‘panic rather than a plan’, says former UK chancellor”.